Proprietary Name: Qmiiz Odt What is the Proprietary Name? Non-Proprietary Name: Meloxicam What is the Non-Proprietary Name? Qmiiz Odt with NDC 70720-175 is a a human prescription drug product labeled by Tersera Therapeutics Llc. The generic name of Qmiiz Odt is meloxicam. The product's dosage form is tablet, orally disintegrating and is administered via oral form. Dosage Form: Tablet, Orally Disintegrating - A solid dosage form containing medicinal substances which disintegrates rapidly, usually within a matter of seconds, when placed upon the tongue. FDA Application Number: NDA211210 What is the FDA Application Number? Start Marketing Date: 02-21-2019 What is the Start Marketing Date? See full prescribing information for complete boxed warning.Nonsteroidal anti-inflammatory drugs (NSAIDs) cause an increased risk of serious cardiovascular thrombotic events, including myocardial infarction and stroke, which can be fatal. This risk may occur early in treatment and may increase with duration of use [see Warning and Precautions (5.1)]QMIIZ ODT is contraindicated in the setting of coronary artery bypass graft (CABG) surgery [see Contradictions (4), Warnings and Precautions (5.1)]NSAIDs cause an increased risk of serious gastrointestinal (GI) adverse events including bleeding, ulceration, and perforation of the stomach or intestines, which can be fatal. These events can occur at any time during use and without warning symptoms. Elderly patients and patients with a prior history of peptic ulcer disease and/or GI bleeding are at greater risk for serious GI events (see Warnings and Precautions (5.2)]. QMIIZ ODT is indicated for relief of the signs and symptoms of osteoarthritis in adults [see Clinical Studies (14.1)]. QMIIZ ODT is indicated for relief of the signs and symptoms of rheumatoid arthritis in adults [see Clinical Studies (14.1)]. QMIIZ ODT is indicated for relief of the signs and symptoms of pauciarticular or polyarticular course juvenile rheumatoid arthritis in pediatric patients who weigh greater than or equal to 60 kg [see Dosage and Administration (2.4) and Clinical Studies (14.2)]. Carefully consider the potential benefits and risks of QMIIZ ODT and other treatment options before deciding to use QMIIZ ODT. Use the lowest effective dosage for the shortest duration consistent with individual patient treatment goals [see Warnings and Precautions (5)]. After observing the response to initial therapy with QMIIZ ODT, adjust the dose to suit an individual patient's needs. In adults, the maximum recommended daily oral dose of QMIIZ ODT is 15 mg regardless of formulation. In patients with hemodialysis, a maximum daily dosage of 7.5 mg is recommended [see Use in Specific Populations (8.7) and Clinical Pharmacology (12.3)]. With QMIIZ ODT, administration with liquid is not necessary. QMIIZ ODT may be taken without regard to timing of meals. 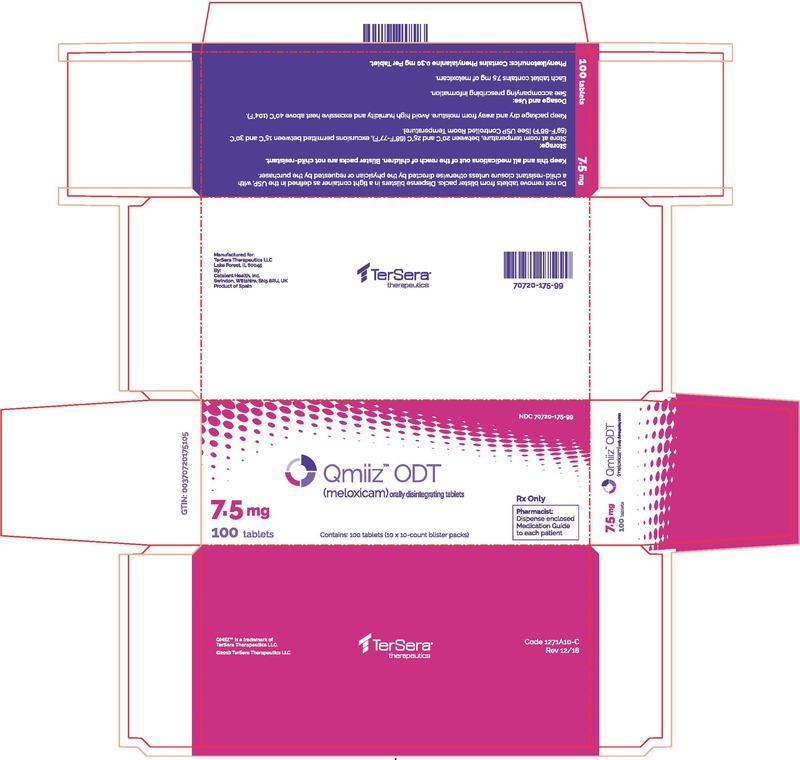 Leave QMIIZ ODT in the original package until the time of administration. Be sure that hands are dry when handling an orally disintegrating tablet. Open the carton and peel back the foil on the blister. Do not push the tablet through the foil as this could damage the tablet. Gently remove the tablet from the blister and place it in the mouth, or onto the tongue, immediately after removing from the blister. The tablet will disintegrate quickly in saliva and can be easily swallowed with or without drinking liquid. For the relief of the signs and symptoms of osteoarthritis, the recommended starting and maintenance oral dose of QMIIZ ODT is 7.5 mg once daily. Some patients may receive additional benefit by increasing the dose to 15 mg once daily. For the relief of the signs and symptoms of rheumatoid arthritis, the recommended starting and maintenance oral dose of QMIIZ ODT is 7.5 mg once daily. Some patients may receive additional benefit by increasing the dose to 15 mg once daily. For the treatment of juvenile rheumatoid arthritis, the recommended oral dose of QMIIZ ODT is 7.5 mg once daily in children who weigh greater than or equal to 60 kg. There was no additional benefit demonstrated by increasing the dose above 7.5 mg in clinical trials. Only use QMIIZ ODT tablets in children who weigh greater than or equal to 60 kg. The use of QMIIZ ODT in subjects with severe renal impairment is not recommended. In patients on hemodialysis, the maximum dosage of QMIIZ ODT is 7.5 mg per day [see Use in Specific Populations (8.7) and Clinical Pharmacology (12.3)]. QMIIZ ODT (meloxicam) orally disintegrating tablets have not shown equivalent systemic exposure with a comparable pharmacokinetic profile to other approved formulations of oral meloxicam. Therefore, QMIIZ ODT tablets are not interchangeable with other formulations of oral meloxicam product even if the total milligram strength is the same. Do not substitute similar dose strengths of QMIIZ ODT with other formulations of oral meloxicam products. QMIIZ ODT (meloxicam) orally disintegrating tablet is a freeze-dried orally administered formulation containing 7.5 mg or 15 mg meloxicam and is designed to rapidly disintegrate in the mouth. Both strengths are orange-flavored, yellow, circular tablets and are debossed with an identifying marking: either 7.5 or 15 (see images below). Clinical trials of several cyclooxygenase-2 (COX-2) selective and nonselective NSAIDs of up to three years duration have shown an increased risk of serious cardiovascular (CV) thrombotic events, including myocardial infarction (MI) and stroke, which can be fatal. Based on available data, it is unclear that the risk for CV thrombotic events is similar for all NSAIDs. The relative increase in serious CV thrombotic events over baseline conferred by NSAID use appears to be similar in those with and without known CV disease or risk factors for CV disease. However, patients with known CV disease or risk factors had a higher absolute incidence of excess serious CV thrombotic events, due to their increased baseline rate. Some observational studies found that this increased risk of serious CV thrombotic events began as early as the first weeks of treatment. The increase in CV thrombotic risk has been observed most consistently at higher doses. There is no consistent evidence that concurrent use of aspirin mitigates the increased risk of serious CV thrombotic events associated with NSAID use. The concurrent use of aspirin and an NSAID, such as meloxicam, increases the risk of serious gastrointestinal (GI) events [see Warnings and Precautions (5.2)]. Status Post-Coronary Artery Bypass Graft (CABG) SurgeryTwo large, controlled clinical trials of a COX-2 selective NSAID for the treatment of pain in the first 10-14 days following CABG surgery found an increased incidence of myocardial infarction and stroke. NSAIDs are contraindicated in the setting of CABG [see Contraindications (4)]. Post-MI PatientsObservational studies conducted in the Danish National Registry have demonstrated that patients treated with NSAIDs in the post-MI period were at increased risk of reinfarction, CV-related death, and all-cause mortality beginning in the first week of treatment. In this same cohort, the incidence of death in the first year post-MI was 20 per 100 person years in NSAID-treated patients compared to 12 per 100 person years in non-NSAID exposed patients. Although the absolute rate of death declined somewhat after the first year post-MI, the increased relative risk of death in NSAID users persisted over at least the next four years of follow-up. Avoid the use of QMIIZ ODT in patients with a recent MI unless the benefits are expected to outweigh the risk of recurrent CV thrombotic events. If QMIIZ ODT is used in patients with a recent MI, monitor patients for signs of cardiac ischemia. Risk Factors for GI Bleeding, Ulceration, and PerforationPatients with a prior history of peptic ulcer disease and/or GI bleeding who used NSAIDs had a greater than 10-fold increased risk for developing a GI bleed compared to patients without these risk factors. Other factors that increase the risk of GI bleeding in patients treated with NSAIDs include longer duration of NSAID therapy; concomitant use of oral corticosteroids, aspirin, anticoagulants, or selective serotonin reuptake inhibitors (SSRIs); smoking; use of alcohol; older age; and poor general health status. Most postmarketing reports of fatal GI events occurred in elderly or debilitated patients. Additionally, patients with advanced liver disease and/or coagulopathy are at increased risk for GI bleeding. If a serious GI adverse event is suspected, promptly initiate evaluation and treatment, and discontinue QMIIZ ODT until a serious GI adverse event is ruled out. Renal ToxicityLong-term administration of NSAIDs, including QMIIZ ODT, has resulted in renal papillary necrosis, renal insufficiency, acute renal failure, and other renal injury. The renal effects of QMIIZ ODT may hasten the progression of renal dysfunction in patients with preexisting renal disease. Because some QMIIZ ODT metabolites are excreted by the kidney, monitor patients for signs of worsening renal function. Correct volume status in dehydrated or hypovolemic patients prior to initiating QMIIZ ODT. Monitor renal function in patients with renal or hepatic impairment, heart failure, dehydration, or hypovolemia during use of QMIIZ ODT [see Drug Interactions (7)]. No information is available from controlled clinical studies regarding the use of QMIIZ ODT in patients with advanced renal disease. Avoid the use of QMIIZ ODT in patients with advanced renal disease unless the benefits are expected to outweigh the risk of worsening renal function. If QMIIZ ODT is used in patients with advanced renal disease, monitor patients for signs of worsening renal function [see Clinical Pharmacology (12.3)]. HyperkalemiaIncreases in serum potassium concentration, including hyperkalemia, have been reported with use of NSAIDs, even in some patients without renal impairment. In patients with normal renal function, these effects have been attributed to a hyporeninemic-hypoaldosteronism state. Osteoarthritis and Rheumatoid ArthritisThe meloxicam Phase 2/3 clinical trial database includes 10,122 OA patients and 1012 RA patients treated with meloxicam 7.5 mg/day, 3505 OA patients and 1351 RA patients treated with meloxicam 15 mg/day. Meloxicam at these doses was administered to 661 patients for at least 6 months and to 312 patients for at least one year. Approximately 10,500 of these patients were treated in ten placebo- and/or active-controlled osteoarthritis trials and 2363 of these patients were treated in ten placebo- and/or active-controlled rheumatoid arthritis trials. Gastrointestinal (GI) adverse events were the most frequently reported adverse events in all treatment groups across meloxicam trials. Table 2 depicts adverse events that occurred in ≥2% of the meloxicam treatment groups in a 12-week placebo- and active-controlled osteoarthritis trial. Table 3 depicts adverse events that occurred in ≥2% of the meloxicam treatment groups in two 12-week placebo-controlled rheumatoid arthritis trials. The adverse events that occurred with meloxicam in ≥2% of patients treated short-term (4 to 6 weeks) and long-term (6 months) in active-controlled osteoarthritis trials are presented in Table 4. Higher doses of meloxicam (22.5 mg and greater) have been associated with an increased risk of serious GI events; therefore, the daily dose of QMIIZ ODT should not exceed 15 mg.
Pauciarticular and Polyarticular Course Juvenile Rheumatoid Arthritis (JRA)Three hundred and eighty-seven patients with pauciarticular and polyarticular course JRA were exposed to meloxicam with doses ranging from 0.125 to 0.375 mg/kg per day in three clinical trials. These studies consisted of two 12-week multicenter, double-blind, randomized trials (one with a 12-week open-label extension and one with a 40-week extension) and one 1-year open-label PK study. The adverse events observed in these pediatric studies with meloxicam were similar in nature to the adult clinical trial experience, although there were differences in frequency. In particular, the following most common adverse events, abdominal pain, vomiting, diarrhea, headache, and pyrexia, were more common in the pediatric than in the adult trials. Rash was reported in seven (<2%) patients receiving meloxicam. No unexpected adverse events were identified during the course of the trials. The adverse events did not demonstrate an age or gender-specific subgroup effect. The following is a list of adverse drug reactions occurring in <2% of patients receiving meloxicam in clinical trials involving approximately 16,200 patients. Risk SummaryUse of NSAIDs, including QMIIZ ODT, during the third trimester of pregnancy increases the risk of premature closure of the fetal ductus arteriosus. Avoid use of NSAIDs including QMIIZ ODT, in pregnant women starting at 30 weeks of pregnancy (third trimester) [see Warnings and Precautions (5.10)]. There are no adequate and well-controlled studies of QMIIZ ODT in pregnant women. Data from observational studies regarding potential embryofetal risks of NSAID use in women in the first or second trimesters of pregnancy are inconclusive. In animal reproduction studies, embryofetal death was observed in rats and rabbits treated during the period of organogenesis with meloxicam at oral doses equivalent to 0.65- and 6.5- times the maximum recommended human dose (MRHD) of QMIIZ ODT. No teratogenic effects were observed in rats and rabbits treated with meloxicam during organogenesis at an oral dose equivalent to 2.6- and 26-times the MRHD. An increased incidence of septal heart defects were observed in rabbits treated throughout embryogenesis with meloxicam at an oral dose equivalent to 78-times the MRHD. In pre- and post-natal reproduction studies, there was an increased incidence of dystocia, delayed parturition, and decreased offspring survival at 0.08-times the MRHD of meloxicam [see Data]. Based on animal data, prostaglandins have been shown to have an important role in endometrial vascular permeability, blastocyst implantation, and decidualization. In animal studies, administration of prostaglandin synthesis inhibitors, such as meloxicam, resulted in increased pre- and post-implantation loss. The estimated background risk of major birth defects and miscarriage for the indicated population is unknown. All pregnancies have a background risk of birth defect, loss, or other adverse outcomes. In the general U.S. population, all clinically recognized pregnancies, regardless of drug exposure, have a background rate of 2-4% for major malformations, and 15-20% for pregnancy loss. Fetal/Neonatal Adverse ReactionsPremature Closure of the Fetal Ductus Arteriosus: Avoid use of NSAID's in pregnant women after 30 weeks gestation because NSAIDs, including QMIIZ ODT, can cause premature closure of the fetal ductus arteriosus (see Data). Animal DataMeloxicam was not teratogenic when administered to pregnant rats during fetal organogenesis at oral doses up to 4 mg/kg/day (2.6-fold greater than the MRHD of 15 mg of QMIIZ ODT based on BSA comparison). Administration of meloxicam to pregnant rabbits throughout embryogenesis produced an increased incidence of septal defects of the heart at an oral dose of 60 mg/kg/day (78-fold greater than the MRHD based on BSA comparison). The no effect level in this study was 20 mg/kg/day (26-fold greater than the MRHD based on BSA conversion). In rats and rabbits, embryo-lethality occurred at oral meloxicam doses of 1 mg/kg/day and 5 mg/kg/day, respectively (0.65- and 6.5-fold greater, respectively, than the MRHD based on BSA comparison) when administered throughout organogenesis. Oral administration of meloxicam to pregnant rats during late gestation through lactation increased the incidence of dystocia, delayed parturition, and decreased offspring survival at meloxicam doses of 0.125 mg/kg/day or greater (0.08-times MRHD based on BSA comparison). Risk SummaryThere are no human data available on whether meloxicam is present in human milk, or on the effects on breastfed infants, or on milk production. Meloxicam is present in the milk of lactating rats at concentrations higher than those in plasma. The concentration of the drug in animal milk does not necessarily predict the concentration of drug in human milk. However, when a drug is present in animal milk, it is likely that the drug will be present in human milk. The developmental and health benefits of breastfeeding should be considered along with the mother's clinical need for QMIIZ ODT and any potential adverse effects on the breastfed infant from QMIIZ ODT or from the underlying maternal condition. FemalesBased on the mechanism of action, the use of prostaglandin-mediated NSAIDs, including QMIIZ ODT, may delay or prevent rupture of ovarian follicles, which has been associated with reversible infertility in some women. Published animal studies have shown that administration of prostaglandin synthesis inhibitors has the potential to disrupt prostaglandin-mediated follicular rupture required for ovulation. Small studies in women treated with NSAIDs have also shown a reversible delay in ovulation. Consider withdrawal of NSAIDs, including QMIIZ ODT, in women who have difficulties conceiving or who are undergoing investigation of infertility. MalesQMIIZ ODT may compromise fertility in males of reproductive potential. In a published study, oral administration of meloxicam to male rats for 35 days resulted in decreased sperm count and motility and histopathological evidence of testicular degeneration at 0.6-times the MRHD based on BSA comparison [See Nonclinical Toxicology (13.1)]. It is not known if these effects on fertility are reversible. AbsorptionThe absolute bioavailability of meloxicam tablets was 89% following a single oral dose of 30 mg compared with 30 mg IV bolus injection. Following single intravenous doses, dose-proportional pharmacokinetics were shown in the range of 5 mg to 60 mg. After multiple oral doses, the pharmacokinetics of meloxicam tablets were dose-proportional over the range of 7.5 mg to 15 mg. Mean Cmax was achieved within four to five hours after a 7.5 mg meloxicam tablet was taken under fasted conditions, indicating a prolonged drug absorption. With multiple dosing, steady-state concentrations were reached by Day 5. A second meloxicam concentration peak occurs around 12 to 14 hours post-dose suggesting biliary recycling. QMIIZ ODT has been shown to meet bioequivalence criteria for both Cmax and AUC as compared to MOBIC tablets. Table 6 shows single-dose and steady-state pharmacokinetic parameters for meloxicam 7.5 and 15 mg tablets. Food and Antacid EffectsAdministration of meloxicam tablets following a high fat breakfast (75 g of fat) resulted in mean peak drug levels (i.e., Cmax) being increased by approximately 22% while the extent of absorption (AUC) was unchanged. The time to maximum concentration (Tmax) was achieved between 5 and 6 hours. In comparison, neither the AUC nor the Cmax values for meloxicam suspension were affected following a similar high fat meal, while mean Tmax values were increased to approximately 7 hours. No pharmacokinetic interaction was detected with concomitant administration of antacids. Administration of QMIIZ ODT with a high-fat breakfast (150 calories from protein, 250 calories from carbohydrates, and 500 calories from fat) did not affect the Cmax or AUC of meloxicam, while the median Tmax was increased from 4 to 12 hours. QMIIZ ODT can be administered without regard to timing of meals or concomitant administration of antacids. DistributionThe mean volume of distribution (Vss) of meloxicam is approximately 10 L. Meloxicam is ~99.4% bound to human plasma proteins (primarily albumin) within the therapeutic dose range. The fraction of protein binding is independent of drug concentration, over the clinically relevant concentration range, but decreases to ~99% in patients with renal disease. Meloxicam penetration into human red blood cells, after oral dosing, is less than 10%. Following a radiolabeled dose, over 90% of the radioactivity detected in the plasma was present as unchanged meloxicam. MetabolismMeloxicam is extensively metabolized in the liver. Meloxicam metabolites include 5'-carboxy meloxicam (60% of dose), from P-450 mediated metabolism formed by oxidation of an intermediate metabolite 5'-hydroxymethyl meloxicam which is also excreted to a lesser extent (9% of dose). In vitro studies indicate that CYP2C9 (cytochrome P450 metabolizing enzyme) plays an important role in this metabolic pathway with a minor contribution of the CYP3A4 isozyme. Patients' peroxidase activity is probably responsible for the other two metabolites which account for 16% and 4% of the administered dose, respectively. All the four metabolites are not known to have any in vivo pharmacological activity. ExcretionMeloxicam excretion is predominantly in the form of metabolites, and occurs to equal extents in the urine and feces. Only traces of the unchanged parent compound are excreted in the urine (0.2%) and feces (1.6%). The extent of the urinary excretion was confirmed for unlabeled multiple 7.5 mg doses: 0.5%, 6%, and 13% of the dose were found in urine in the form of meloxicam, and the 5'-hydroxymethyl and 5'-carboxy metabolites, respectively. There is significant biliary and/or enteral secretion of the drug. This was demonstrated when oral administration of cholestyramine following a single IV dose of meloxicam decreased the AUC of meloxicam by 50%. The mean elimination half-life (t1/2) ranges from 15 hours to 20 hours. The elimination half-life is constant across dose levels indicating linear metabolism within the therapeutic dose range. Plasma clearance ranges from 7 to 9 mL/min. PediatricAfter single (0.25 mg/kg) dose administration and after achieving steady state (0.375 mg/kg/day), there was a general trend of approximately 30% lower exposure in younger patients (2 to 6 years old) as compared to the older patients (7 to 16 years old). The older patients had meloxicam exposures similar (single dose) or slightly reduced (steady state) to those in the adult patients, when using AUC values normalized to a dose of 0.25 mg/kg [see Dosage and Administration (2.4)]. The meloxicam mean (SD) elimination half-life was 15.2 (10.1) and 13.0 hours (3.0) for the 2- to 6-year-old patients, and 7- to 16-year-old patients, respectively. In a covariate analysis, utilizing population pharmacokinetics body-weight, but not age, was the single predictive covariate for differences in the meloxicam apparent oral plasma clearance. The body-weight normalized apparent oral clearance values were adequate predictors of meloxicam exposure in pediatric patients. The pharmacokinetics of QMIIZ ODT in pediatric patients under 2 years of age have not been investigated. GeriatricElderly males (≥65 years of age) exhibited meloxicam plasma concentrations and steady-state pharmacokinetics similar to young males. Elderly females (≥65 years of age) had a 47% higher AUCss and 32% higher Cmax ss as compared to younger females (≤55 years of age) after body weight normalization. Despite the increased total concentrations in the elderly females, the adverse event profile was comparable for both elderly patient populations. A smaller free fraction was found in elderly female patients in comparison to elderly male patients. SexYoung females exhibited slightly lower plasma concentrations relative to young males. After single doses of 7.5 mg meloxicam, the mean elimination half-life was 19.5 hours for the female group as compared to 23.4 hours for the male group. At steady state, the data were similar (17.9 hours vs 21.4 hours). This pharmacokinetic difference due to gender is likely to be of little clinical importance. There was linearity of pharmacokinetics and no appreciable difference in the Cmax or Tmax across genders. Hepatic ImpairmentFollowing a single 15 mg dose of meloxicam there was no marked difference in plasma concentrations in patients with mild (Child-Pugh Class I) or moderate (Child- Pugh Class II) hepatic impairment compared to healthy volunteers. Protein binding of meloxicam was not affected by hepatic impairment. No dosage adjustment is necessary in patients with mild to moderate hepatic impairment. Patients with severe hepatic impairment (Child-Pugh Class III) have not been adequately studied [see Warnings and Precautions (5.3) and Use in Specific Populations (8.6)]. Renal ImpairmentMeloxicam pharmacokinetics have been investigated in subjects with mild and moderate renal impairment. Total drug plasma concentrations of meloxicam decreased and total clearance of meloxicam increased with the degree of renal impairment while free AUC values were similar in all groups. The higher meloxicam clearance in subjects with renal impairment may be due to increased fraction of unbound meloxicam which is available for hepatic metabolism and subsequent excretion. No dosage adjustment is necessary in patients with mild to moderate renal impairment. Patients with severe renal impairment have not been adequately studied. The use of QMIIZ ODT in subjects with severe renal impairment is not recommended [see Dosage and Administration (2.5), Warnings and Precautions (5.6) and Use in Specific Populations (8.7)]. HemodialysisFollowing a single dose of meloxicam, the free Cmax plasma concentrations were higher in patients with renal failure on chronic hemodialysis (1% free fraction) in comparison to healthy volunteers (0.3% free fraction). Hemodialysis did not lower the total drug concentration in plasma; therefore, additional doses are not necessary after hemodialysis. Meloxicam is not dialyzable [see Dosage and Administration (2.1) and Use in Specific Populations (8.7)]. Aspirin: When NSAIDs were administered with aspirin, the protein binding of NSAIDs were reduced, although the clearance of free NSAID was not altered. When meloxicam is administered with aspirin (1000 mg three times daily) to healthy volunteers, it tended to increase the AUC (10%) and Cmax (24%) of meloxicam. The clinical significance of this interaction is not known. See Table 5 for clinically significant drug interactions of NSAIDs with aspirin [see Drug Interactions (7)]. Cholestyramine: Pretreatment for four days with cholestyramine significantly increased the clearance of meloxicam by 50%. This resulted in a decrease in t1/2, from 19.2 hours to 12.5 hours, and a 35% reduction in AUC. This suggests the existence of a recirculation pathway for meloxicam in the gastrointestinal tract. The clinical relevance of this interaction has not been established. Cimetidine: Concomitant administration of 200 mg cimetidine four times daily did not alter the single-dose pharmacokinetics of 30 mg meloxicam. Digoxin: Meloxicam 15 mg once daily for 7 days did not alter the plasma concentration profile of digoxin after β-acetyldigoxin administration for 7 days at clinical doses. In vitro testing found no protein binding drug interaction between digoxin and meloxicam. Lithium: In a study conducted in healthy subjects, mean pre-dose lithium concentration and AUC were increased by 21% in subjects receiving lithium doses ranging from 804 to 1072 mg twice daily with meloxicam 15 mg QD every day as compared to subjects receiving lithium alone [see Drug Interactions (7)]. Methotrexate: A study in 13 rheumatoid arthritis (RA) patients evaluated the effects of multiple doses of meloxicam on the pharmacokinetics of methotrexate taken once weekly. Meloxicam did not have a significant effect on the pharmacokinetics of single doses of methotrexate. In vitro, methotrexate did not displace meloxicam from its human serum binding sites [see Drug Interactions (7)]. Warfarin: The effect of meloxicam on the anticoagulant effect of warfarin was studied in a group of healthy subjects receiving daily doses of warfarin that produced an INR (International Normalized Ratio) between 1.2 and 1.8. In these subjects, meloxicam did not alter warfarin pharmacokinetics and the average anticoagulant effect of warfarin as determined by prothrombin time. However, one subject showed an increase in INR from 1.5 to 2.1. Caution should be used when administering QMIIZ ODT with warfarin since patients on warfarin may experience changes in INR and an increased risk of bleeding complications when a new medication is introduced [see Drug Interactions (7)]. CarcinogenesisThere was no increase in tumor incidence in long-term carcinogenicity studies in rats (104 weeks) and mice (99 weeks) administered meloxicam at oral doses up to 0.8 mg/kg/day in rats and up to 8.0 mg/kg/day in mice (up to 0.5- and 2.6-times, respectively, the maximum recommended human dose [MRHD] of 15 mg/day QMIIZ ODT based on body surface area [BSA] comparison). MutagenesisMeloxicam was not mutagenic in an Ames assay, or clastogenic in a chromosome aberration assay with human lymphocytes and an in vivo micronucleus test in mouse bone marrow. Impairment of FertilityMeloxicam did not impair male and female fertility in rats at oral doses up to 9 mg/kg/day in males and 5 mg/kg/day in females (up to 5.8- and 3.2-times greater, respectively, than the MRHD based on BSA comparison). In a published study, oral administration of 1 mg/kg (0.6-times the MRHD based on BSA comparison) meloxicam to male rats for 35 days resulted in decreased sperm count and motility and histopathological evidence of testicular degeneration. Important Administration InstructionsPatients should be instructed not to remove the tablet from the blister from the carton until just prior to dosing. The blister pack should then be peeled open with dry hands and the orally disintegrating tablet placed on the tongue, where the tablet will disintegrate. Cardiovascular Thrombotic EventsAdvise patients to be alert for the symptoms of cardiovascular thrombotic events, including chest pain, shortness of breath, weakness, or slurring of speech, and to report any of these symptoms to their healthcare provider immediately [see Warnings and Precautions (5.1)]. Gastrointestinal Bleeding, Ulceration, and PerforationAdvise patients to report symptoms of ulcerations and bleeding, including epigastric pain, dyspepsia, melena, and hematemesis to their healthcare provider. In the setting of concomitant use of low-dose aspirin for cardiac prophylaxis, inform patients of the increased risk for the signs and symptoms of GI bleeding [see Warnings and Precautions (5.2)]. HepatotoxicityInform patients of the warning signs and symptoms of hepatotoxicity (e.g., nausea, fatigue, lethargy, diarrhea, pruritus, jaundice, right upper quadrant tenderness, and "flu-like" symptoms). If these occur, instruct patients to stop QMIIZ ODT and seek immediate medical therapy [see Warnings and Precautions (5.3)]. Heart Failure and EdemaAdvise patients to be alert for the symptoms of congestive heart failure including shortness of breath, unexplained weight gain, or edema and to contact their healthcare provider if such symptoms occur [see Warnings and Precautions (5.5)]. Anaphylactic ReactionsInform patients of the signs of an anaphylactic reaction (e.g., difficulty breathing, swelling of the face or throat). Instruct patients to seek immediate emergency help if these occur [see Contraindications (4) and Warnings and Precautions (5.7)]. Serious Skin ReactionsAdvise patients to stop QMIIZ ODT immediately if they develop any type of rash and to contact their healthcare provider as soon as possible [see Warnings and Precautions (5.9)]. Female FertilityAdvise females of reproductive potential who desire pregnancy that NSAIDs, including QMIIZ ODT, may be associated with a reversible delay in ovulation [see Use in Specific Populations (8.3)]. Male FertilityAdvise males of reproductive potential that QMIIZ ODT may compromise fertility. It is not known, if these effects are reversible [see Use in Specific Populations (8.3)]. Fetal ToxicityAdvise pregnant women to avoid use of QMIIZ ODT after 30 weeks gestation because of the risk of the premature closing of the fetal ductus arteriosus. Advise females of reproductive potential to contact their healthcare provider with a known or suspected pregnancy [see Warnings and Precautions (5.10) and Use in Specific Populations (8.1)]. Avoid Concomitant Use of NSAIDsInform patients that the concomitant use of QMIIZ ODT with other NSAIDs or salicylates (e.g., diflunisal, salsalate) is not recommended due to the increased risk of gastrointestinal toxicity, and little or no increase in efficacy [see Warnings and Precautions (5.2) and Drug Interactions (7)]. Alert patients that NSAIDs may be present in “over the counter” medications for treatment of colds, fever, or insomnia. Use of NSAIDs and Low-Dose AspirinInform patients not to use low-dose aspirin concomitantly with QMIIZ ODT until they talk to their healthcare provider [see Drug Interactions (7)]. PhenylketonuriaInform phenylketonuric patients that QMIIZ ODT contains phenylalanine (a component of aspartame). Each 7.5-mg orally disintegrating tablet contains 0.30 mg phenylalanine, and each 15-mg orally disintegrating tablet contains 0.59 mg phenylalanine [see Warnings and Precautions (5.14)]. NSAIDs, including meloxicam, can cause serious gastrointestinal (GI) adverse events including inflammation, bleeding, ulceration, and perforation of the esophagus, stomach, small intestine, or large intestine, which can be fatal. These serious adverse events can occur at any time, with or without warning symptoms, in patients treated with NSAIDs. Only one in five patients who develop a serious upper GI adverse event on NSAID therapy is symptomatic. Upper GI ulcers, gross bleeding, or perforation caused by NSAIDs occurred in approximately 1% of patients treated for 3-6 months, and in about 2-4% of patients treated for one year. However, even short-term NSAID therapy is not without risk. Elevations of alanine aminotransferase (ALT) or aspartate aminotransferase (AST) (three or more times the upper limit of normal [ULN]) have been reported in approximately 1% of NSAID-treated patients in clinical trials. In addition, rare, sometimes fatal, cases of severe hepatic injury, including fulminant hepatitis, liver necrosis, and hepatic failure have been reported. Elevations of ALT or AST (less than three times ULN) may occur in up to 15% of patients treated with NSAIDs including meloxicam. Inform patients of the warning signs and symptoms of hepatotoxicity (e.g., nausea, fatigue, lethargy, diarrhea, pruritus, jaundice, right upper quadrant tenderness, and "flu-like" symptoms). If clinical signs and symptoms consistent with liver disease develop, or if systemic manifestations occur (e.g., eosinophilia, rash, etc. ), discontinue QMIIZ ODT immediately, and perform a clinical evaluation of the patient [see Use in Specific Populations (8.6) and Clinical Pharmacology (12.3)]. NSAIDs, including QMIIZ ODT, can lead to new onset or worsening of preexisting hypertension, either of which may contribute to the increased incidence of CV events. Patients taking angiotensin converting enzyme (ACE) inhibitors, thiazide diuretics, or loop diuretics may have impaired response to these therapies when taking NSAIDs [see Drug Interactions (7)]. Additionally, fluid retention and edema have been observed in some patients treated with NSAIDs. Use of meloxicam may blunt the CV effects of several therapeutic agents used to treat these medical conditions (e.g., diuretics, ACE inhibitors, or angiotensin receptor blockers [ARBs]) [see Drug Interactions (7)]. Avoid the use of QMIIZ ODT in patients with severe heart failure unless the benefits are expected to outweigh the risk of worsening heart failure. If QMIIZ ODT is used in patients with severe heart failure, monitor patients for signs of worsening heart failure. Meloxicam has been associated with anaphylactic reactions in patients with and without known hypersensitivity to meloxicam and in patients with aspirin-sensitive asthma [see Contraindications (4) and Warnings and Precautions (5.8)]. A subpopulation of patients with asthma may have aspirin-sensitive asthma which may include chronic rhinosinusitis complicated by nasal polyps; severe, potentially fatal bronchospasm; and/or intolerance to aspirin and other NSAIDs. Because cross-reactivity between aspirin and other NSAIDs has been reported in such aspirin- sensitive patients, QMIIZ ODT is contraindicated in patients with this form of aspirin sensitivity [see Contraindications (4)]. When QMIIZ ODT is used in patients with preexisting asthma (without known aspirin sensitivity), monitor patients for changes in the signs and symptoms of asthma. NSAIDs, including meloxicam, can cause serious skin adverse reactions such as exfoliative dermatitis, Stevens-Johnson Syndrome (SJS), and toxic epidermal necrolysis (TEN), which can be fatal. These serious events may occur without warning. Inform patients about the signs and symptoms of serious skin reactions, and to discontinue the use of QMIIZ ODT at the first appearance of skin rash or any other sign of hypersensitivity. QMIIZ ODT is contraindicated in patients with previous serious skin reactions to NSAIDs [see Contraindications (4)]. Meloxicam may cause premature closure of the fetal ductus arteriosus. Avoid use of NSAIDs, including QMIIZ ODT, in pregnant women starting at 30 weeks of gestation (third trimester) [see Use in Specific Populations (8.1)]. Anemia has occurred in NSAID-treated patients. This may be due to occult or gross blood loss, fluid retention, or an incompletely described effect on erythropoiesis. If a patient treated with QMIIZ ODT has any signs or symptoms of anemia, monitor hemoglobin or hematocrit. NSAIDs, including QMIIZ ODT, may increase the risk of bleeding events. Co-morbid conditions such as coagulation disorders or concomitant use of warfarin, other anticoagulants, antiplatelet agents (e.g., aspirin), selective serotonin reuptake inhibitors (SSRIs) and serotonin norepinephrine reuptake inhibitors (SNRIs) may increase this risk. Monitor these patients for signs of bleeding [see Drug Interactions (7)]. QMIIZ ODT contains phenylalanine (a component of aspartame). The 7.5 mg and 15 mg orally disintegrating tablets contain 0.30 mg and 0.59 mg of phenylalanine, respectively. QMIIZ ODT is contraindicated in patients with phenylketonuria [see Contraindications (4)]. The pharmacological activity of QMIIZ ODT in reducing inflammation, and possibly fever, may diminish the utility of diagnostic signs in detecting infections. Because serious GI bleeding, hepatotoxicity, and renal injury can occur without warning symptoms or signs, consider monitoring patients on long-term NSAID treatment with a complete blood count (CBC) and a chemistry profile periodically [see Warnings and Precautions (5.2, 5.3, 5.6)]. A total of 100 subjects entered four studies with QMIIZ ODT; 36 subjects entered two separate pilot bioavailability studies (BA); 32 subjects entered a bioequivalence (BE) study, and 32 subjects entered a food-effect study. The adverse reactions from the BA, BE, and food-effect studies are summarized in Table 1. Ten (10) adverse reactions were reported after receiving QMIIZ ODT and ten (10) adverse reactions were reported after receiving meloxicam tablets. The most frequently reported adverse reactions associated with QMIIZ ODT were: blood pressure decreased (2 subjects, 2.0%) and headache (2 subjects, 2.0%). The most frequently reported adverse reactions associated with meloxicam tablets were: blood pressure decreased (3 subjects, 3.0%) and alanine aminotransferase increased (2 subjects, 2.0%). The following adverse reactions have been identified during post-approval use of meloxicam. Because these reactions are reported voluntarily from a population of uncertain size, it is not always possible to reliably estimate their frequency or establish a causal relationship to drug exposure. Decisions about whether to include an adverse event from spontaneous reports in labeling are typically based on one or more of the following factors: (1) seriousness of the event, (2) number of reports, or (3) strength of causal relationship to the drug. Adverse reactions reported in worldwide post marketing experience or the literature include: acute urinary retention; agranulocytosis; alterations in mood (such as mood elevation); anaphylactoid reactions including shock; erythema multiforme; exfoliative dermatitis; interstitial nephritis; jaundice; liver failure; Stevens-Johnson syndrome; toxic epidermal necrolysis, and infertility female. See Table 5 for clinically significant drug interactions with meloxicam [see Warnings and Precautions (5.2, 5.6, 5.11) and Clinical Pharmacology (12.3)]. Drugs that Interfere with HemostasisClinical Impact:Meloxicam and anticoagulants such as warfarin have a synergistic effect on bleeding. The concomitant use of meloxicam and anticoagulants have an increased risk of serious bleeding compared to the use of either drug alone. Intervention:Monitor patients with concomitant use of QMIIZ ODT with anticoagulants (e.g., warfarin), antiplatelet agents (e.g., aspirin), selective serotonin reuptake inhibitors (SSRIs), and serotonin norepinephrine reuptake inhibitors (SNRIs) for signs of bleeding [see Warnings and Precautions (5.11)]. AspirinClinical Impact:Controlled clinical studies showed that the concomitant use of NSAIDs and analgesic doses of aspirin does not produce any greater therapeutic effect than the use of NSAIDs alone. In a clinical study, the concomitant use of an NSAID and aspirin was associated with a significantly increased incidence of GI adverse reactions as compared to use of the NSAID alone [see Warnings and Precautions (5.2)]. Intervention:Concomitant use of QMIIZ ODT and low dose aspirin or analgesic doses of aspirin is not generally recommended because of the increased risk of bleeding [see Warnings and Precautions (5.11)].QMIIZ ODT is not a substitute for low dose aspirin for cardiovascular protection. ACE Inhibitors, Angiotensin Receptor Blockers, or Beta-BlockersClinical Impact:NSAIDs may diminish the antihypertensive effect of angiotensin converting enzyme (ACE) inhibitors, angiotensin receptor blockers (ARBs), or beta-blockers (including propranolol). In patients who are elderly, volume-depleted (including those on diuretic therapy), or have renal impairment, co-administration of an NSAID with ACE inhibitors or ARBs may result in deterioration of renal function, including possible acute renal failure. These effects are usually reversible. Intervention:During concomitant use of QMIIZ ODT and ACE inhibitors, ARBs, or beta-blockers, monitor blood pressure to ensure that the desired blood pressure is obtained. During concomitant use of QMIIZ ODT and ACE inhibitors or ARBs in patients who are elderly, volume-depleted, or have impaired renal function, monitor for signs of worsening renal function [see Warnings and Precautions (5.6)]. When these drugs are administered concomitantly, patients should be adequately hydrated. Assess renal function at the beginning of the concomitant treatment and periodically thereafter. DiureticsClinical Impact:Clinical studies, as well as post-marketing observations, showed that NSAIDs reduced the natriuretic effect of loop diuretics (e.g., furosemide) and thiazide diuretics in some patients. This effect has been attributed to the NSAID inhibition of renal prostaglandin synthesis. However, studies with furosemide agents and meloxicam have not demonstrated a reduction in natriuretic effect. Furosemide single and multiple dose pharmacodynamics and pharmacokinetics are not affected by multiple doses of meloxicam. Intervention:During concomitant use of QMIIZ ODT with diuretics, observe patients for signs of worsening renal function, in addition to assuring diuretic efficacy including antihypertensive effects [see Warnings and Precautions (5.6)]. LithiumClinical Impact:NSAIDs have produced elevations in plasma lithium levels and reductions in renal lithium clearance. The mean minimum lithium concentration increased 15%, and the renal clearance decreased by approximately 20%. This effect has been attributed to NSAID inhibition of renal prostaglandin synthesis [see Clinical Pharmacology (12.3)]. Intervention:During concomitant use of QMIIZ ODT and lithium, monitor patients for signs of lithium toxicity. MethotrexateClinical Impact:Concomitant use of NSAIDs and methotrexate may increase the risk for methotrexate toxicity (e.g., neutropenia, thrombocytopenia, renal dysfunction). Intervention:During concomitant use of QMIIZ ODT and methotrexate, monitor patients for methotrexate toxicity. CyclosporineClinical Impact:Concomitant use of QMIIZ ODT and cyclosporine may increase cyclosporine's nephrotoxicity. Intervention:During concomitant use of QMIIZ ODT and cyclosporine, monitor patients for signs of worsening renal function. NSAIDs and SalicylatesClinical Impact:Concomitant use of meloxicam with other NSAIDs or salicylates (e.g., diflunisal, salsalate) increases the risk of GI toxicity, with little or no increase in efficacy [see Warnings and Precautions (5.2)]. Intervention:The concomitant use of meloxicam with other NSAIDs or salicylates is not recommended. PemetrexedClinical Impact:Concomitant use of QMIIZ ODT and pemetrexed may increase the risk of pemetrexed-associated myelosuppression, renal, and GI toxicity (see the pemetrexed prescribing information). Intervention:During concomitant use of QMIIZ ODT and pemetrexed, in patients with renal impairment whose creatinine clearance ranges from 45 to 79 mL/min, monitor for myelosuppression, renal and GI toxicity.Patients taking meloxicam should interrupt dosing for at least five days before, the day of, and two days following pemetrexed administration.In patients with creatinine clearance below 45 mL/min, the concomitant administration of meloxicam with pemetrexed is not recommended. CYP2C9 inhibitorsClinical Impact:In vitro studies indicate that CYP2C9 (cytochrome P450 metabolizing enzyme) plays an important role in the metabolic pathway for meloxicam with a minor contribution of the CYP3A4 isozyme. Thus, concomitant usage of CYP2C9 inhibitors (such as amiodarone, fluconazole, and sulphaphenazole) may lead to abnormally high plasma levels of meloxicam due to reduced metabolic clearance [see Use in Specific Populations (8.8); Clinical Pharmacology (12.3, 12.5)]. Intervention:Consider dose reduction in patients undergoing treatment with CYP2C9 inhibitors, and monitor patients for adverse effects. The safety and effectiveness of meloxicam in pediatric JRA patients from 2 to 17 years of age has been evaluated in three clinical trials [see Dosage and Administration (2.4), Adverse Reactions (6.1) and Clinical Studies (14.2)]. No dose adjustment is necessary in patients with mild to moderate hepatic impairment. Patients with severe hepatic impairment have not been adequately studied. Since meloxicam is significantly metabolized in the liver and hepatotoxicity may occur, use meloxicam with caution in patients with hepatic impairment [see Warnings and Precautions (5.3) and Clinical Pharmacology (12.3)]. No dose adjustment is necessary in patients with mild to moderate renal impairment. Patients with severe renal impairment have not been studied. The use of QMIIZ ODT in subjects with severe renal impairment is not recommended. In patients on hemodialysis, meloxicam should not exceed 7.5 mg per day. Meloxicam is not dialyzable [see Clinical Pharmacology (12.3)]. In patients who are known or suspected to be poor CYP2C9 metabolizers based on genotype or previous history/experience with other CYP2C9 substrates (such as warfarin or phenytoin), consider dose reduction, as these patients may have abnormally high plasma levels of meloxicam due to reduced metabolic clearance. Monitor these patients for adverse effects. Symptoms following acute NSAID overdosages have been typically limited to lethargy, drowsiness, nausea, vomiting, and epigastric pain, which have been generally reversible with supportive care. Gastrointestinal bleeding has occurred. Hypertension, acute renal failure, respiratory depression, and coma have occurred, but were rare [see Warnings and Precautions (5.1, 5.2, 5.4, 5.6)]. Manage patients with symptomatic and supportive care following an NSAID overdosage. There are no specific antidotes. Consider emesis and/or activated charcoal (60 to 100 grams in adults, 1 to 2 grams per kg of body weight in pediatric patients) and/or osmotic cathartic in symptomatic patients seen within four hours of ingestion or in patients with a large overdosage (5 to 10 times the recommended dosage). Forced diuresis, alkalinization of urine, hemodialysis, or hemoperfusion may not be useful due to high protein binding. There is limited experience with meloxicam overdosage. Cholestyramine is known to accelerate the clearance of meloxicam. Accelerated removal of meloxicam by 4 g oral doses of cholestyramine given three times a day was demonstrated in a clinical trial. Administration of cholestyramine may be useful following an overdosage. For additional information about overdosage treatment, call a poison control center (1-800-222-1222). QMIIZ ODT (meloxicam) orally disintegrating tablet is a nonsteroidal anti-inflammatory drug available as orally disintegrating tablets containing 7.5 mg or 15 mg meloxicam and is designed to rapidly disintegrate in the mouth upon oral administration. Both strengths are orange-flavored, yellow, circular tablets and debossed with either 7.5 or 15. The inactive ingredients in QMIIZ ODT tablet include gelatin, mannitol, citric acid, aspartame, and orange flavoring agent. 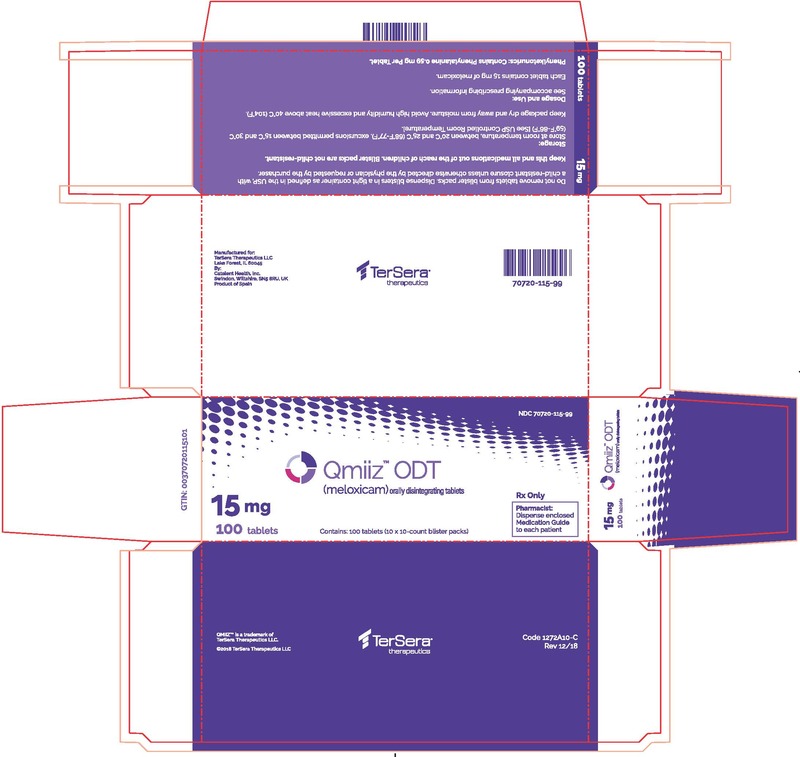 QMIIZ ODT is packaged in aluminum blister packs composed of a multi-layered (5 layers) laminated blister film and a lidding foil. The lidding foil is designed to be peeled open to allow the removal of the lidding foil over each tablet and removal of the tablet. The tablet begins disintegrating in the mouth within seconds, allowing its contents to be subsequently swallowed with or without liquid or chewing. Meloxicam has analgesic, anti-inflammatory and antipyretic properties. The mechanism of action of QMIIZ ODT, like that of other NSAIDs, is not completely understood but involves inhibition of cyclooxygenase (COX-1 and COX-2). 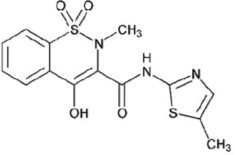 Meloxicam is a potent inhibitor of prostaglandin synthesis in vitro. Meloxicam concentrations reached during therapy have produced in vivo effects. Prostaglandins sensitize afferent nerves and potentiate the action of bradykinin in inducing pain in animal models. Prostaglandins are mediators of inflammation. Because meloxicam is an inhibitor of prostaglandin synthesis, its mode of action may be due to a decrease of prostaglandins in peripheral tissues. CYP2C9 activity is reduced in individuals with genetic variants such as CYP2C9*2 and CYP2C9*3 polymorphisms. Limited data from three published reports showed that meloxicam AUC was substantially higher in individuals with reduced CYP2C9 activity, particularly in poor metabolizers (e.g., *3/*3), compared to normal metabolizers (*1/*1). The frequency of CYP2C9 poor metabolizer genotypes varies based on racial/ethnic background but is generally present in <5% of the population. The use of meloxicam for the treatment of the signs and symptoms of osteoarthritis of the knee and hip was evaluated in a 12-week, double-blind, controlled trial. Meloxicam (3.75 mg, 7.5 mg, and 15 mg daily) was compared to placebo. The four primary endpoints were investigator's global assessment, patient global assessment, patient pain assessment, and total WOMAC score (a self-administered questionnaire addressing pain, function, and stiffness). Patients on meloxicam 7.5 mg daily and meloxicam 15 mg daily showed significant improvement in each of these endpoints compared with placebo. The use of meloxicam for the management of signs and symptoms of osteoarthritis was evaluated in six double-blind, active-controlled trials outside the U.S. ranging from 4 weeks' to 6 months' duration. In these trials, the efficacy of meloxicam, in doses of 7.5 mg/day and 15 mg/day, was comparable to piroxicam 20 mg/day and diclofenac SR 100 mg/day and consistent with the efficacy seen in the U.S. trial. The use of meloxicam for the treatment of the signs and symptoms of rheumatoid arthritis was evaluated in a 12-week, double-blind, controlled multinational trial. Meloxicam (7.5 mg, 15 mg, and 22.5 mg daily) was compared to placebo. The primary endpoint in this study was the ACR20 response rate, a composite measure of clinical, laboratory, and functional measures of RA response. Patients receiving meloxicam 7.5 mg and 15 mg daily showed significant improvement in the primary endpoint compared with placebo. No incremental benefit was observed with the 22.5 mg dose compared to the 15 mg dose. The use of meloxicam for the treatment of the signs and symptoms of pauciarticular or polyarticular course JRA in patients 2 years of age and older was evaluated in two 12-week, double-blind, parallel-arm, active-controlled trials. Both studies included three arms: naproxen and two doses of meloxicam. In both studies, meloxicam dosing began at 0.125 mg/kg/day (7.5 mg maximum) or 0.25 mg/kg/day (15 mg maximum), and naproxen dosing began at 10 mg/kg/day. One study used these doses throughout the 12-week dosing period, while the other incorporated a titration after 4 weeks to doses of 0.25 mg/kg/day and 0.375 mg/kg/day (22.5 mg maximum) of meloxicam and 15 mg/kg/day of naproxen. The efficacy analysis used the ACR Pediatric 30 responder definition, a composite of parent and investigator assessments, counts of active joints and joints with limited range of motion, and erythrocyte sedimentation rate. The proportion of responders were similar in all three groups in both studies, and no difference was observed between the meloxicam dose groups. StorageStore at 20° to 25°C (68° to 77°F), excursions permitted between 15°C and 30°C (59° to 86°F) [See USP Controlled Room Temperature]. Avoid high humidity and excessive heat above 40°C (104°F). Advise the patient to read the FDA-approved patient labeling (Medication Guide) that accompanies each prescription dispensed. Inform patients, families or their caregivers of the following information before initiating therapy with an NSAID and periodically during the course of ongoing therapy. What are NSAIDs?NSAIDs are used to treat pain and redness, swelling, and heat (inflammation) from medical conditions such as different types of arthritis, menstrual cramps, and other types of short-term pain. Who should not take QMIIZ ODT?Do not take QMIIZ ODT:if you have had an asthma attack, hives, or other allergic reaction with aspirin or any other NSAIDs. If you have phenylketonuria (PKU). QMIIZ ODT contains phenylalanine (a component of aspartame). Are pregnant or plan to become pregnant. Talk to your healthcare provider if you are considering taking NSAIDs during pregnancy. You should not take NSAIDs after 29 weeks of pregnancy.are breastfeeding or plan to breast feed.Tell your healthcare provider about all the medicines you take, including prescription or over-the- counter medicines, vitamins or herbal supplements. NSAIDs and some other medicines can interact with each other and cause serious side effects. Do not start taking any new medicine without talking to your healthcare provider first.How should I take QMIIZ ODT Orally Disintegrating Tablet (ODT)?Take QMIIZ ODT exactly as prescribed. Leave QMIIZ ODT in the package it comes in until you are ready to take it. Open the carton and peel back the foil on the blister. Do not push the tablet through the foil. As soon as you open the blister, remove the tablet and put it onto your tongue. If you take too much of your NSAID, call your healthcare provider or get medical help right away.These are not all the possible side effects of NSAIDs. For more information, ask your healthcare provider or pharmacist about NSAIDs. Call your doctor for medical advice about side effects. You may report side effects to FDA at 1-800-FDA-1088. Other information about NSAIDsAspirin is an NSAID but it does not increase the chance of a heart attack. Aspirin can cause bleeding in the brain, stomach, and intestines. Aspirin can also cause ulcers in the stomach and intestines. Some NSAIDs are sold in lower doses without a prescription (over-the-counter). Talk to your healthcare provider before using over-the-counter NSAIDs for more than 10 days. How should I store QMIIZ ODT?Store QMIIZ ODT at room temperature between 68°F to 77°F (20°C to 25°C). Excursions permitted between 59°F to 86°F (15°C to 30°C). Keep QMIIZ ODT dry and away from moisture.Keep QMIIZ ODT and all medicines out of the reach of children.General information about the safe and effective use of NSAIDs.Medicines are sometimes prescribed for purposes other than those listed in a Medication Guide. Do not use NSAIDs for a condition for which it was not prescribed. Do not give NSAIDs to other people, even if they have the same symptoms that you have. It may harm them. If you would like more information about NSAIDs, talk with your healthcare provider. You can ask your pharmacist or healthcare provider for information about NSAIDs that is written for health professionals. Manufactured for: TerSera Therapeutics LLC, Lake Forest, IL 60045Manufactured by: Catalent Health, Inc., Swindon, Wilshire, SN5 8RU, UKQMIIZ ODT™ is a trademark of TerSera Therapeutics LLC.© 2018 TerSera Therapeutics LLCFor more information, go to www.QMIIZODT.com or call 1- (844) 334-4035.